HP's Touchsmart tx2 is the first consumer-oriented convertible notebook to feature a multitouch technology built into the display. The 12.1-inch screen uses a capacitive touchpanel that can track two points simultaneously, operates with fingers or a stylus, and comes with the Mediasmart 2.0 interface customized for the notebook. While Dell's oft-mentioned Latitude XT came out last year with the multitouch power to simultaneously track all five fingers, the feature was kept dormant until the middle of 2008 and lacks any realy mainstream software to take advantage of the tech. The Mediasmart 2.0 software lets you watch movies, look at photos, play music, listen to radio and watch TV on demand. HP is partnering with MTV networks to bring IPTV content in from MTV, Comedy Central and Nickelodeon. On the hardware side, you can carry out a variety of gestures on the tx2 including select, drag, double tap, pinch, zoom, arc, rotate and flick. In addition to working with the MediaSmart software, the multitouch gestures will also work with a variety of Windows software out of the box including Microsoft Office, most internet browsers, and most photo applications. In addition to the 1200x800 multitouch capability, the 4.5-pound tx2 has 2.1GHz AMD Turion X2 processor, ATI Radeon HD 3200 Graphics, 8 GB RAM, 500 GB HDD (5400 RPM), Bluetooth, integrated webcam, 8x DVD burner, VGA out and a digital pen. PALO ALTO, Calif., Nov. 19, 2008 – HP today announced the industry's first convertible notebook PC with multi-touch technology designed specifically for consumers. Building upon the touch innovation HP developed for its TouchSmart desktop PCs, the HP TouchSmart tx2 Notebook PC was developed for people on the go who value having their digital content at their fingertips – literally. The enhanced HP MediaSmart digital entertainment software suite on the tx2 allows users to more naturally select, organize and manipulate digital files such as photos, music, video and web content by simply touching the screen. "Breezing through websites and enjoying photos or video at the tap, whisk or flick of a finger is an entirely new way to enjoy digital content on a notebook PC," said Ted Clark, senior vice president and general manager, Notebook Global Business Unit, Personal Systems Group, HP. "With the introduction of the TouchSmart tx2, HP is providing users an easier, more natural way to interact with their PCs, and furthering touch innovation." The tx2 is the latest result of HP's 25 years of touch technology experience, which began with the introduction of the HP-150, a touch screen PC that was well ahead of its time, in 1983. The tx2 gives customers the choice to set aside the keyboard and mouse in favor of a more natural user interface – the fingertip. HP's multi-touch display delivers quick and easy access to information, entertainment and other social media. The tx2 recognizes simultaneous input from more than one finger using "capacitive multi-touch technology," which enables the use of gestures such as pinch, rotate, arc, flick, press and drag, and single and double tap. The convertible design with a twist hinge allows consumers to enjoy the TouchSmart in three modes: PC, display and tablet. With a rechargeable digital ink pen, users can turn the tx2 into a tablet PC to write, sketch, draw, take notes or graph right onto the screen – and then automatically convert handwriting into typed text. Starting at less than 4.5 pounds, the tx2 possesses a 12.1-inch diagonal BrightView LED display and an HP Imprint "Reaction" design. The tx2 notebook's HP MediaSmart software lets customers enjoy photos, listen to music and watch Internet(1) TV or movies in high-definition. (2) The software is optimized for multi-touch input while also making it simple to search digital content. In an effort to provide consumers with rich content through the Internet, HP has expanded its partnership with MTV Networks (MTVN) by offering video content from 10 television channels and online brands within MediaSmart's TV module. Beginning in December, users can enjoy all the best content from Nickelodeon, the No. 1 entertainment brand for kids; MTV, the premier destination for music and youth culture programming; and COMEDY CENTRAL, the only all-comedy network and the No. 1 network in primetime for men ages 18 to 24. MTVN also plans to make content from Atom, CMT, GameTrailers, Logo, Spike, The N and VH1 available within MediaSmart's TV module. 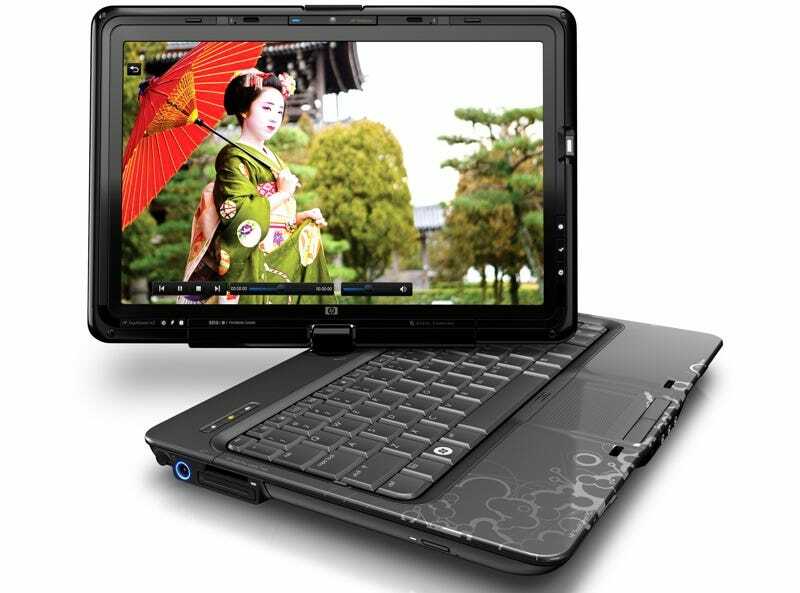 The MediaSmart software was first brought to HP HDX notebook PCs in September, using the interface first popularized on HP TouchSmart PCs. HP plans to include the software in the tx2 and all future HP consumer notebook PCs. Powered by the AMD Turion™ X2 Ultra Dual-Core Mobile Processor or AMD Turion X2 Dual-Core Mobile Processor(3) and built on Windows® Vista Home Premium, the tx2 will be made available worldwide in an array of configure-to-order options. The HP TouchSmart tx2 series is ENERGY STAR® qualified and EPEAT™ Silver registered. Mercury-free LED display panels are included on the tx2 as part of HP's ongoing commitment to reduce its impact on the environment. The HP tx Series Notebook Stand elevates the tx2, enhancing its usability while stationary, including making it possible to put the PC in an upright position for full interactivity with the touch screen. HP Webcam with Integrated Microphones allows users to see brighter, cleaner images when chatting over an Internet(1) connection. The tx2 offers access to a variety of self-help tools built in and online. It also is supported by HP Total Care, which enables consumers to reach support agents 24/7 by phone, email or real-time chat. The HP TouchSmart tx2 is available for ordering today in the United States at www.hpdirect.com with a starting U.S. price of $1,149. (4) More information about the tx2 is available at www.hp.com/go/touchsmarttx2. • Enjoy music, photos, movies and TV programs within HP MediaSmart. • True Tablet PC: Write, draw and erase accurately with the included pen. * All disclaimers shown on the bottom of page 2. Dot and iF material awards. HP Mini Remote Control can be stored in the ExpressCard slot. It's time to play! consumers that enables the use of two fingers to navigate HP's entertainment applications. • ARC: Allows you to move tracks to/from playlists without having to make a straight line. m on the display to launch the MediaSmart Smart Menu. • Exclusive use of EPA SmartWay carriers for reduced transportation-related emissions. HP recommends Windows Vista® Home Premium.